"This is my breast pumping story." "I never would have thought I would become a full-time breast milk pumper." My first son was born in August 2013. I never would have thought I would become a full-time breast milk pumper. I always thought I would nurse my kids until they were at least one year old, and only pump here and there, if at all. It is one of the hardest and selfless things I have ever done. I call it a labour of love. My first son had problems latching. From the day he was born, I started to pump so he could at least have my milk in a bottle. I felt strongly that I didn’t want to use or supplement his nursing with a commercial formula. The lactation consultant said it will be hard, but as long as I pump every 2-3 hours, I’ll be able to keep producing breast milk. "My first son had problems latching". Image supplied. She referred me to another IBCLC (Internationally Bored Certified Lactation Consultant), to see if we could work with my son to get him to latch. While in the hospital he got donor breast milk and I got a good start on saving up my breast milk. I think I had around 1L pumped when leaving the hospital. The first week after my first was born, I rented a double electric breast pump from the hospital. I would pump every two hours around the clock, even at night time after I fed him, I got up and pumped. With all the pump supplies and bottles needing to be washed every day, the first couple of months weren&apos;t pretty. I was exhausted and emotional. I remember I would wake up, my husband would start to feed our son with that day’s supply and I would be sitting at the table pumping. It was hard when I would go to support groups or just anywhere in public because I noticed a lot of mums breastfeeding. I felt sad that I had to use a bottle. I would get looks and whispers when I would get the bottle out even though it was all breast milk, but you couldn’t tell unless I said something. "I would be sitting at the table pumping". Image supplied. There were a lot of tears and I felt like I failed. I kept thinking it wasn’t supposed to be like this. He was supposed to latch right away, but I was determined to get him my milk one way or another. I knew I was doing the best for my son, even though it wasn’t the exact way I wanted to do it, but in the end it will be all worth it! At the time I had WIC, and they gave me a Medela double electric breast pump to keep which was a lifesaver. It took a couple months of appointments with the WIC IBCLC to get him to latch but we did get him to latch a few times, but nursing during the day was still a struggle. He did nurse at night time until he was six months old. At about five months, I pumped every two hours during the day and only 1-2 times during the night. There were times I would pump more during the night if I felt my supply was getting lower. Around that time I had 29.5L saved up, just in case. "When my son was six months old, I found out we were expecting our second baby." Image supplied. When my son was six months old, I found out we were expecting our second baby. I remember the pressure I felt, I was having a hard pregnancy and a lot of people and even the doctors where telling me that my milk will dry up. They told me that I won’t be able to keep exclusively pumping for him and I should start formula right away. It was very discouraging and there were times I just was about to give up, but my husband and the WIC IBCLC were very supportive. They helped and encouraged me along the way. I would have given up if it wasn’t for them. I also felt deeply in my heart that I really wanted to make it to at least one year. I kept pumping every two hours until my son was nine months old and by nine and a half months I had completely stopped pumping. I was about six months pregnant then and it was just became too much and very exhausting. I needed to consider my health and my second baby that I was carrying. I had enough breast milk saved up to last until he was about 10 1/2 months old, and then I would have to start formula. It made me extremely sad, and I felt defeated but I did make it till 10 1/2 months, which was still very good! When my first son was 14 months old, my second son was born. I was very nervous that he wouldn’t latch. I had in my mind I would start pumping no matter what to make sure I would make it to at least one year. I didn’t want to buy formula again (it’s so expensive). I had another C-section and I really wanted to nurse him right after birth, but he had slight breathing difficulties and low blood sugar, so he had to go to the NICU. About four hours after he was born I could go down to try to nurse him. He latched on right away, like he was a pro! I was so happy, words cannot explain! I was still afraid that he may stop breastfeeding because they did supplement (with a bottle) with donor breast milk after each time I nursed him (every three hours). This had something to do with the low blood sugar and to get him to be able to get out of NICU. After every nursing session with him, I would pump. I wouldn’t get a lot in the hospital but every drop helped. Then my milk came in. I continued to pump after every feeding around the clock until he was three months old. I stopped pumping in the middle of the night, and I only pumped every three hours during the daytime. By two months old, breastfeeding was still going great. I didn’t give him the bottle at all, for I was scared he would like it more so I just kept nursing him. We did have some struggles. He had acid reflux and would fight nursing at times. I got mastitis twice and it was all very overwhelming, but after that first two/three months it got easier and the bond we have is indescribable. I would always say to myself, “I only get to do this a couple times in my lifetime, they are only this little once, its only one year (or even a 2-3 years) I have to make sure he gets my milk, and its really not that long!” That really kept me going. I was always still nervous he would stop so I kept pumping at first to have a huge stash of breast milk. I now had over 30.7L saved from pumping while still exclusively breastfeeding my second son. 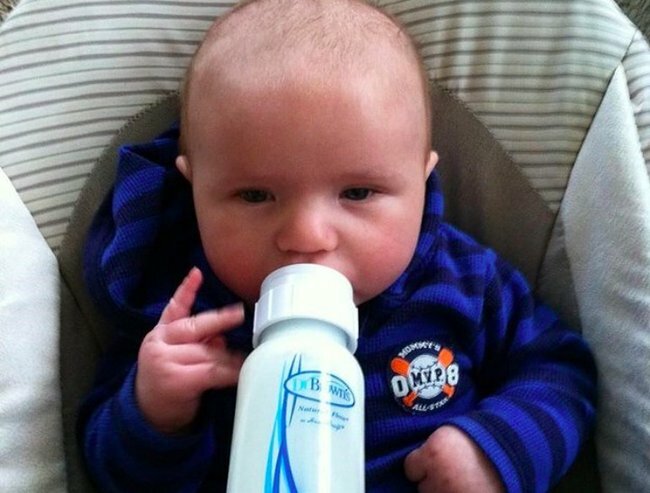 My first son also started to drink some of my pumped milk. At this point, I was pumping over 900 extra mls a day that I did not need. I was told it was possible to donate my milk. I was excited to be able to donate because both my sons had donor breast milk while in the hospital. When my second son was in the NICU for three days, my heart went out to all the tiny babies fighting for their lives, and wished I could help in any small way. I contacted a milk bank to begin the milk donor screening process. I was approved and I donated my first donation of 12.5L. Within three and a half months I had over 50L saved plus the 12.5L I had already donated. I had to go buy another deep freezer to keep it all, and I was still running out of room to store it. So at this point I decided that I would always have at least 29.5L saved for myself if anything happened. From this point I was just pumping to donate. My second donation was for 25.7L. By five and a half months old I had 60 mls saved, and I made my third donation of over 28L. Over the next few months I made four more donations for a grand total of 113.5L donated. I stopped pumping when my second son was about 11 months old, which I was sad about. I did grieve a bit because pumping had been a big part of what I had done for almost two years straight, but it was also nice not having to always think about pumping. Now he is 14 ½ months old and we still breastfeed day and night. I pump maybe 1-2 times a week, mostly when I feel really full and when my son doesn’t want to nurse. If you cannot pump or breastfeed, that’s okay. At least you tried, and any amount helped your baby! Did you struggle with breastfeeding? Tell us your story.